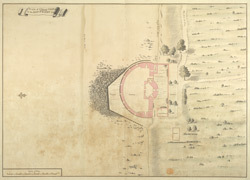 Plan of Cowes Castle on the Northern Coast of the Isle of Wight. The castle was built in 1539 by Henry VIII as part of his sequence of defences against a possible French invasion. It was thought that the Island would be invaded and then used as a base from which to attack England. Stone from the demolished religious houses of Beaulieu and Quarr was used to construct the castle. The build in semi circular in shape and was protected from landward invasions by a deep ditch. By 1855 the castle was being used as a private residence and was leased to the Royal Yacht Club who bought it in 1917.